The Brittany dog gets along fairly well with other dogs and other pets. The Brittany tends to react better with human strangers than it will with animals, although the reason for this is unknown. Training a Brittany is fairly easy, as they are fast learners. Their quickness and their thirst to learn allow them to pick up on things easily. One of the best qualities is that the Brittany makes an adequate watchdog so if you have safety concerns, the Brittany may help ease any reservations. However, if an intruder does approach a Brittany then you may have a problem, as they do a much better job of intimidating an intruder than actually protecting you against one. Overall, the Brittany is a fairly social breed with a friendly temperament. The Brittany breed, requiring very little maintenance, is a very simple breed to take care of. However, these dogs do require a decent amount of physical exercise that includes more than just walking. If you are unable to devote at least an hour a day for working out your dog, then this may not be the right breed for you. For this reason, Brittany’s are recommended for families with active children who live in homes with a backyard for space to run and play. This breed should not reside in an apartment. When it comes to weather concerns this dog is able to withstand most weather conditions, but of course like most living things, it doesn’t thrive as well in extreme weather conditions. Another big part of the Brittany breed is its need for human interaction; this too is true for most living creatures. The Brittany’s coat is not long making it very manageable, especially if it is brushed regularly. A big health concern of the Brittany is Canine Hip Dysplasia (CHD). This effects their “ball-in-socket” joint and may cause looseness and/or abnormal development of the hip joint. Usually, both hips are effected equally if your dog has this. The three treatments for CHD are weight control, use of anti-inflammatory drugs, and exercise restriction. If these do not work, surgery may be the next option. Epilepsy is another disease that the Brittany is prone to and it is very important to monitor your dog if you see that they are acting strangely. Hyperthyroidism also causes Brittany’s some concern. This is one of the biggest reasons that they need to have adequate exercise, more than just walking. A healthy Brittany will typically live to be about 12 to 13 years old. 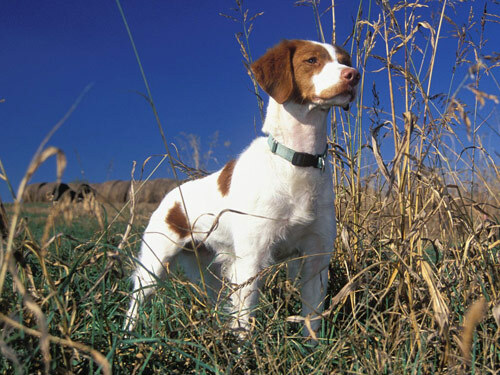 The Brittany is a breed that was derived in the 1800’s when small land spaniels were bred with English Setters to produce a breed that is better suited for the French Sportsmen needs. They were ingrained with a strong scent and were outstanding hunters, especially when hunting woodcock. It was only a matter of time before this breed became popular amongst poachers as well because of their high obedience levels. In 1934, the dog officially became a breed within the AKC and were known as the Brittany Spaniel until the word “Spaniel” was dropped in 1982. The reason it was dropped is because the dog was more similar to the English Setter when it came to hunting rather than a spaniel.